We're always talking about how it's so great to eat seasonal food and local food. But what can we do when nothing really tasty is in season around us? Today I ate an amazing apple and I was trying to think of a way to save it all winter. Hm, well you could make jam out of it and enjoy it all year long. Or, you could make dried fruit! I know that's what Jolie does. 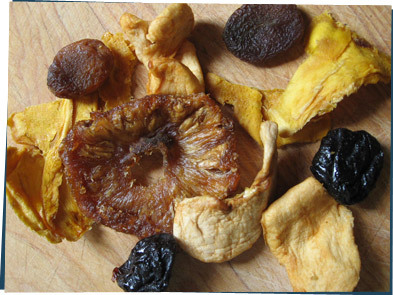 Yep, dried fruit is tasty and healthy and you can make it at home! In the summer when you have lots of fresh fruit, you can dry some out to save it and snack on in the winter when the growing season is over. Cool, huh? Here's how to do it: get a whole bunch of different fruits, and a grownup to help out. Slice the fruit nice and thin, put them on a baking sheet and into the oven they go. Put it on low heat for a few hours and they will be dried out. Once it cools, you can put it in baggies or containers and save them for later! Here's a recipe you can use — enjoy!